It was bloody hot yesterday and the sun blazed with a vengeance right into the deepest nooks of the kitchen in our tiny flat. Despite this, I wanted to bake, urgently. Something with egg whites beaten into a French meringue. Something with just a little bit of sugar and a little cream. Something light and fluffy. Something with lots and lots of chocolate, even though I already had a chocolate molten cake at brunch and we still have a small stash of these in one of our Lunar New Year cookie jars, because nothing shouts love like chocolate. Do you know that chocolate is loaded with antioxidants, calcium, potassium and vitamins (B2 and E to be exact)? And the darker you go the better, because more cocoa triggers the release of neurotransmitters that helps alleviate depression? And that chocolate relieves stress, with just a meager ounce and a half of the dark kind every day? And that oleic acid in chocolate helps boost good cholesterol levels? So the information leaflet from my chocolate vendor told me, but I digress. While it was humid and the room temperature read 33°C (the 100ish grams of butter from my freezer softened in just 15 minutes! ), I fired up the oven, wiped off my sweat, weighed out my leftover egg whites from making lots of these, chopped up the darkest chocolate I could find in my pantry and whipped out my new ramekins. Maybe it's because I have a baker's heart, but then again maybe I really just wanted one a few pots of dark chocolate soufflé which would put me on cloud nine. I've previously tried another recipe which didn't quite deliver but when I saw this, I had high hopes. After staring at the oven watching them rise (this is my kind of entertainment, if you can't already tell), fishing them out carefully and sprinkling some icing sugar on top, I asked Vijay to eat a pot while it's hot and still standing up tall, dark and handsome, as Sherie put it. He slowly savored a mouthful, declared it the best he ever had and fed me a scoop. 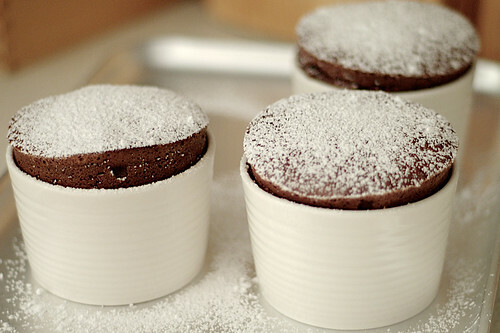 For a short moment I went to chocolate soufflé heaven, albeit a slightly warm one. I wouldn't expect anything less. I mean, amongst the airy meringue bubbles were the darkest Valrhona chocolate and Valrhona cocoa powder and no egg yolks. This, ladies and gentlemen, is the goose bump-inducing real deal. With this and no trace of any heart-shaped confections, I wish you Happy Valentine's Day! Note: I used this sans egg yolks recipe due to my twenty-over-egg-whites-leftover-Lunar-New-Year-baking aftermath but if you don't want to have to think of what to do with leftover egg yolks, go for Stephane's latest recipe for two which includes them. Preheat the oven to 375°F. Use a pastry brush to coat the inside of four 1 1/2-cup soufflé mold with softened butter. Fill the mold with granulated sugar, then pour out the excess. Pour the cream into a saucepan and heat over medium high heat until bubbles begin to form around the edge of the pan. Remove from the heat and make a ganache by adding the cream to the chopped chocolate, let stand for 1 minute. Stir well until combined and all of the chocolate has melted. Place the egg whites in a large mixing bowl and whip on medium speed until foamy. Increase the mixer speed to medium-high and make a French meringue by adding the sugar 1 tablespoon at a time and whipping the whites to stiff but not dry peaks. Do not overwhip the egg whites! Use a rubber spatula to gently fold about half the meringue into the warm chocolate mixture. Then fold the chocolate mixture into the remaining meringue, being careful not to deflate the batter. The soufflé mixture should be homogeneous in color, but a few streaks of meringue in the batter is fine. Use a large spoon to gently place the soufflé mixture in the buttered and sugared mold. Fill to about 1/4 inch below the rim of the mold. Run your thumb around the rim to remove the excess butter and sugar. Bake until the soufflé has risen to about 1 1/2 half-inch over the rim and starts to brown on top, about 12 minutes. Remove from the oven and dust the top with powdered sugar. 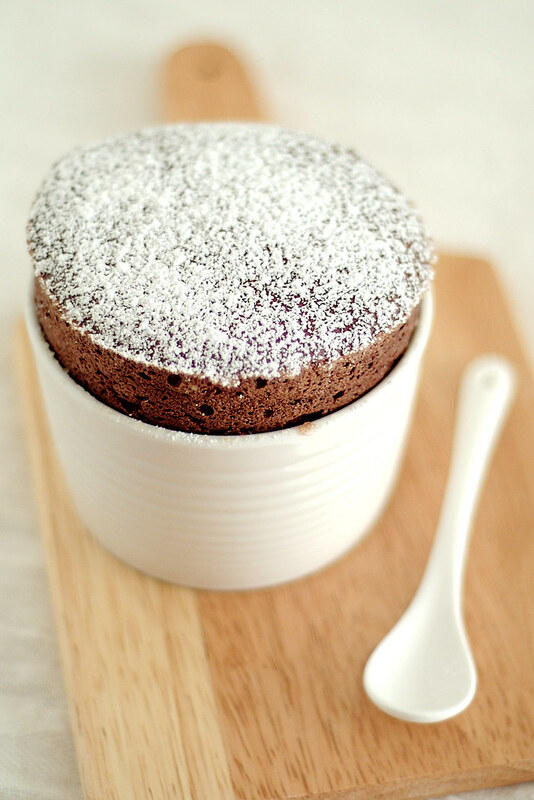 Serve immediately and if you wish (personally I don't think anything else is needed when soufflé heaven beckons), with a side of Grand Marnier creme anglaise or French vanilla ice cream. You are right, nothing shouts love like chocolate! This looks and sounds like the perfect chocolate indulgence, especially served with a creme anglaise - yum! I like it that you did not make another heart shaped confection for Valentine's Day. I should try this when I get back from my travels. 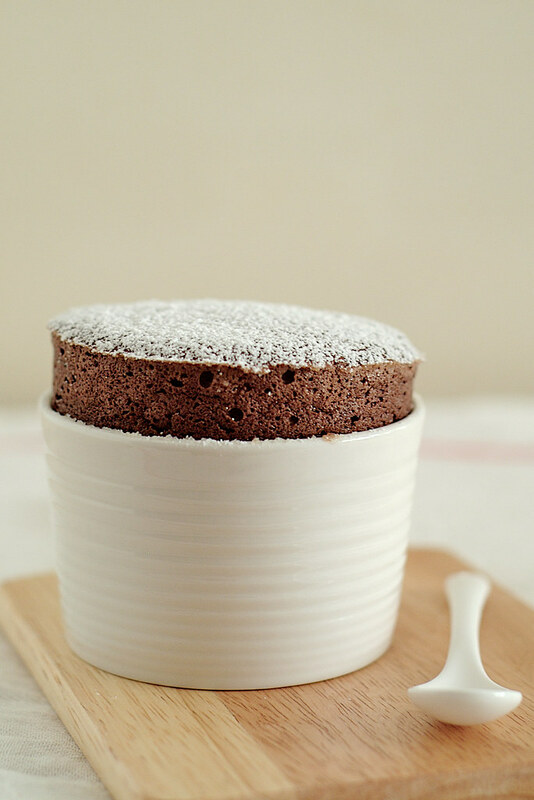 Sylvie: Thanks for dropping by, this is indeed the perfect souffle recipe. Shirley: I was very, very tempted to do a heart-shaped stencil for the icing sugar topping but managed to refrain from what I'm sure Vijay would put as "cheesy". I'm really quite tempted to try my hands on it... so many egg whites still! Sherie, make make! We still have one pot in the fridge. I don't care if I collapse from flu tonight, I'm a have me some chocolate! "Stalked" you here from Ju's website and I'm so glad I did! What a wonderful site. I love those new ramekins! May I know where you got them from? A good change from the drab conventional ones everyone uses. Thanks for the compliment, I try my best. The ramekins are from Gordon Ramsay's collection. I got them from Melbourne. Yes, I wanted something different from the conventional ones. What I really want though is this one from Crate and Barrel but I haven't chanced on anyone going to the US yet. Alan, incidentally I got the conventional ones from Pantry Magic (now another name) as I couldn't find any at the normal departmental stores and at that time ToTT was not yet in business. They were not cheap either. I'm not so good at sourcing competitively priced bakeware, I just buy things I want when I see them, fearing I won't be able to find them elsewhere! Hey, i'm from HK too, so yeah lol. it tasted really good, but still. it shrunk. any comments on how to not make it shrink? oh and was it you followed this recipe exactly, and it didn't shrink? if not i might give it a try..
P.S. i saw your recipe for the pandan chiffon cake, wondering where you can buy pandan leaves in Hong Kong. pupcrazy: I'm not from HK but am currently mostly here for work. There are many reasons for soufflés to shrink, it could be the recipe or the way you beat the egg whites or the way you mix in the egg whites. You can try this recipe and with a ginger puree and see if it works. RE pandan leaves in HK, I haven't been to the markets to check as I can't cook here but the next time I'm at a supermarket I'll take a look.